Prominent & Leading Wholesale Trader from Mumbai, we offer r 305 and r 307 finger module. 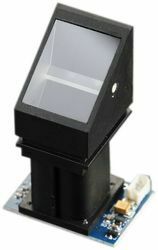 R307 Fingerprint Module consists of optical fingerprint sensor, high-speed DSP processor, high-performance fingerprint alignment algorithm, high-capacity FLASH chips and other hardware and software composition, stable performance, simple structure, with fingerprint entry, image processing, fingerprint matching, search and template storage and other functions. Looking for FINGER MODULE ?